Locality: United States, Colorado, Boulder, Vicinity of Red Snowbank, Niwot Ridge, Institute of Arctic and Alpine Research, ca. 8 miles north of Nederland. Occurrence Remarks: Pedicularis sudetica Willd. subsp. scopulorum (Gray) Hulten, det. by Gerald D. Carr, 13 June 1970. 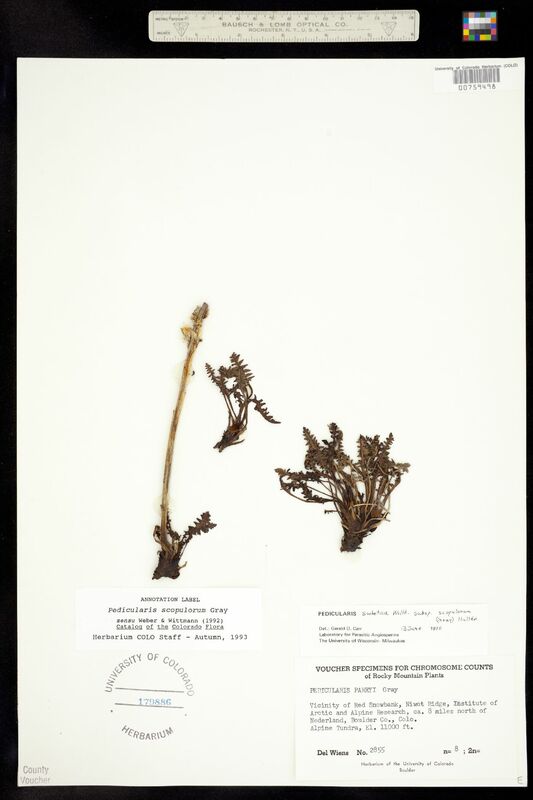 Original ID: Pedicularis parryi Gray. Voucher Specimens for Chromosome Counts of Rocky Mountain Plants. n=8.